JASPER is friendly, confident and curious boy who is a real ladies man! He loves to follow his foster mom around and talk to her. He's very smart and loves to investigate everything from the windows to closets to doors. Jasper watches as you are getting ready for your day and even likes you to wash his face with a warm wash cloth! Jasper likes a quieter environment without lots of noises or children. 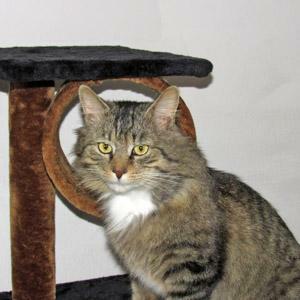 He is a little cautious of men, although he would do just fine in a home with a male caretaker who is kind and gentle. He likes to follow you everywhere and is happy to also chill out when you are sitting down watching TV or working on the computer. He gets into a schedule quickly with eating time, play time and sleep time. Jasper is very playful and likes odd things like hair ties and pencils. When jasper plays he gets caught in the moment, but then suddenly it's over and he'll just flop down. So if you want photos, keep that camera nearby! When its bedtime, Jasper trots over to his foster mom's bed, plops himself down and begins grooming himself. He doesn't always sleep on the bed but when he hears you stirring in the morning, he comes to greet you. As soon as you get up, he jumps down and runs to his food bowl. Jasper also has a mind of his own and lets you know when he's had a little too much stimulation with a swish of his tail or a meow. He can also get a little nippy but his signals are obvious so just pay attention to what he is telling you. Jasper will do best in an adult only home although an older cat-savvy child would be ok. No dogs since he wouldn't be happy with barking! Jasper was a stray kitty roaming his neighborhood greeting people. A kind woman had been feeding him on and off, not knowing if he had a home. One day Jasper showed up with a nasty wound on his neck. It was clear that Jasper had been lost or abandoned, or badly neglected. 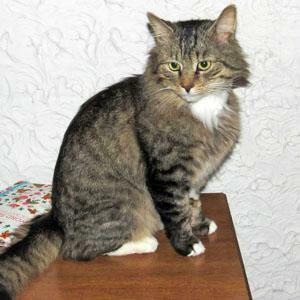 After contacting SPCA, we took swift action to bring Jasper into our care. 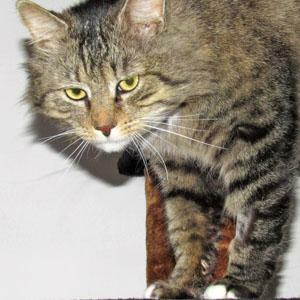 Sadly, as with many roaming males outdoors, Jasper is FIV positive. The wound on his neck has healed nicely, and Jasper has been neutered and vaccinated. 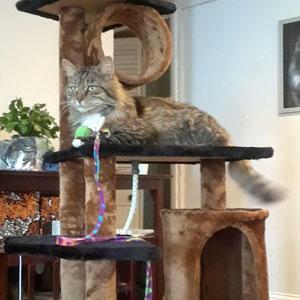 Now living safely indoors, Jasper has adapted easily to an indoor life and shows no interest in being outdoors. Jasper is ready for a home of his own. We waive adoption fees for FIV positive cats.